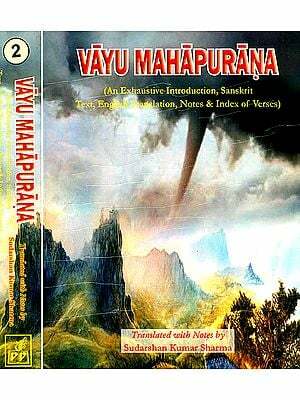 This thirty-seventh volume in the series on Ancient Indian Tradition and Mythology constitutes the first part (Purvardha) of the Vyu Purana of which the second part (Uttarardha) also is in press and will follow shortly as the thirty-eighth volume. 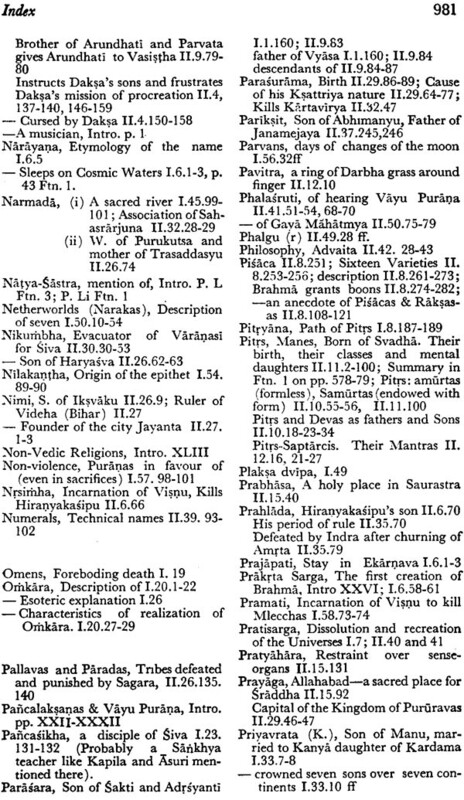 This part contains the English translation of Chapters 1-61 comprising the first two Padas or Sections out of the total four Padas into which the Purana is divided, viz. 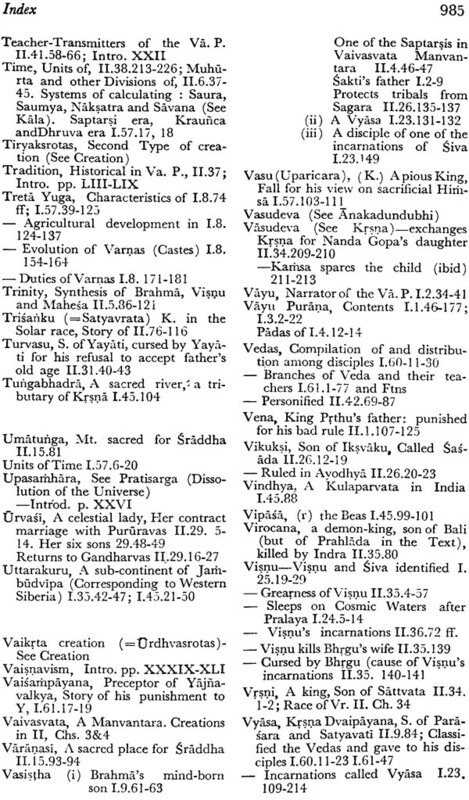 Prakrya, Upodghata, Anusanga and Upasainhara Padas. 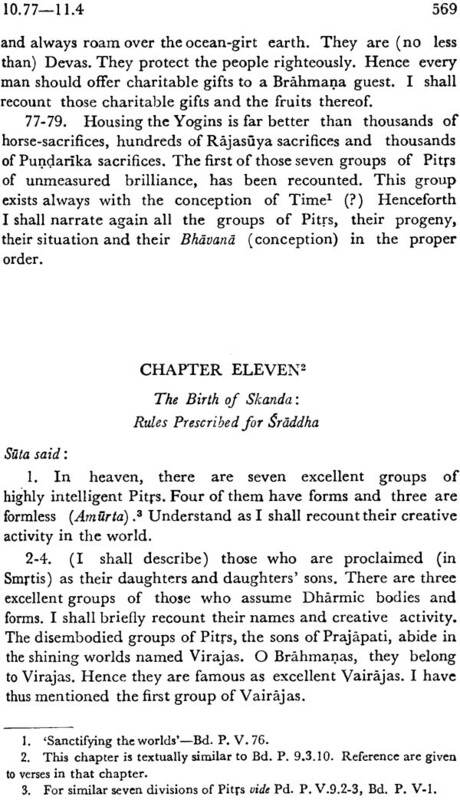 The project of this series was envisaged in 1970 by the late Lala Sundar Lal Jam of Messrs. Motilal Banarsidass. 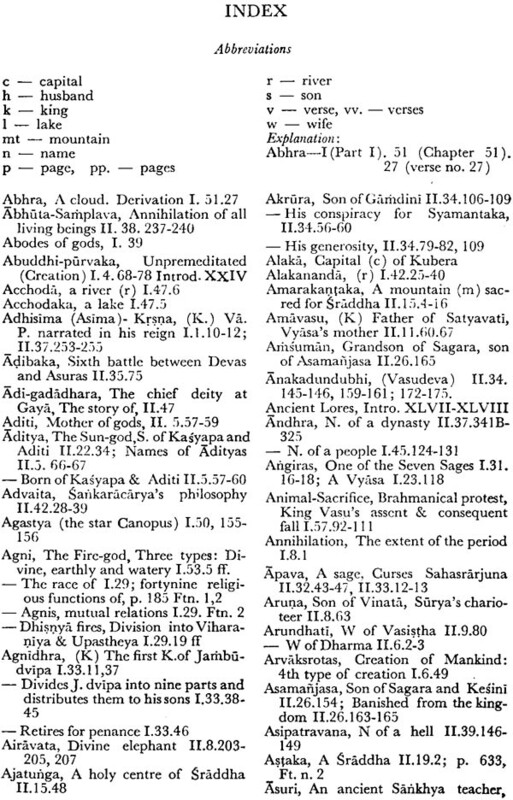 Thirty- seven volumes of the series, including the present one, have so far been published and others are in progress. 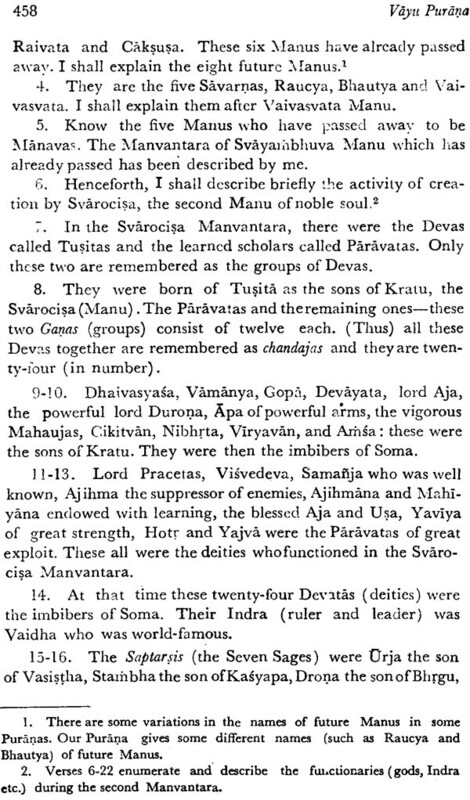 Complete sets of ten major Purai)as, viz. 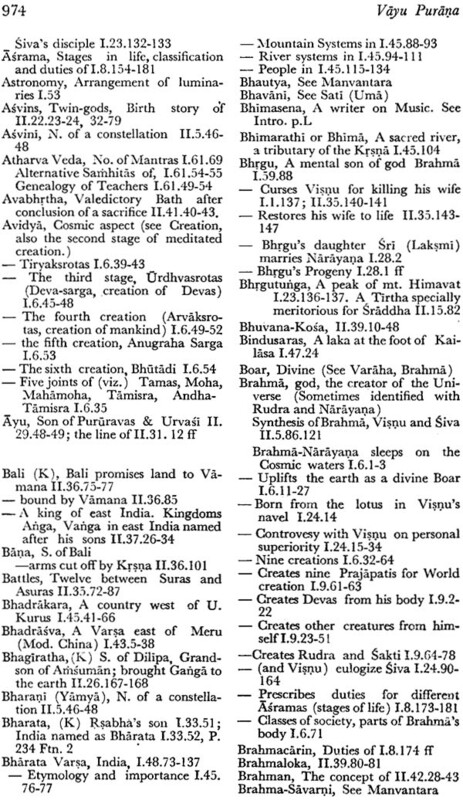 Agni, Bhagavata, Brahma, Brahmanda, Garug’a, Karma, Linga, .Yidrada, Siva and Varaha have already been made available in English to the lovers of ancient Indian wisdom and it is hoped that this eleventh one, Vãyu Purãna, will also be complete much before the end of the year. 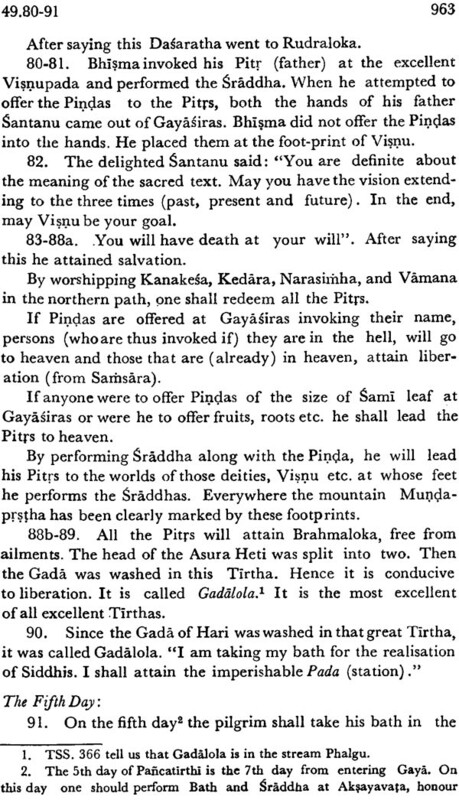 The Vayu or Vayaviya Puraua gets its name from the Wind-god who is said to be its promulgator, and it is a Saiva Purana in the sense that it has been composed for the propagation of devotion to and worship of god Siva. 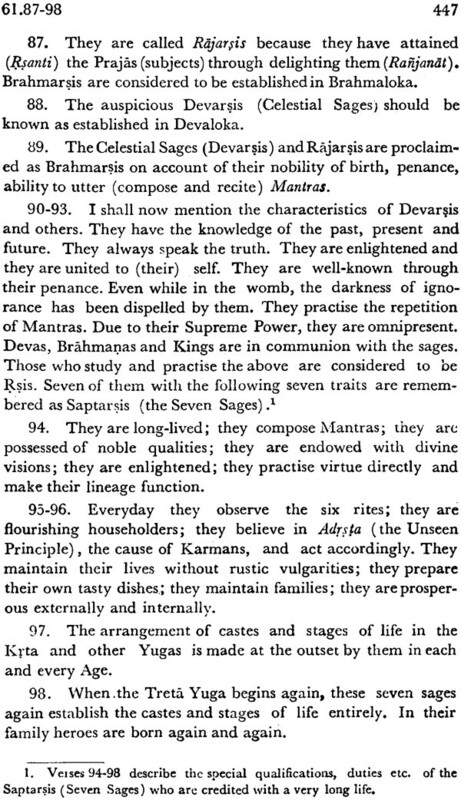 It discusses the well known five topics of the Puranas, viz, creation, dissolution and re-creation, genealogy of gods, sages etc., periods called Manvantaras, and description of royal dynasties. 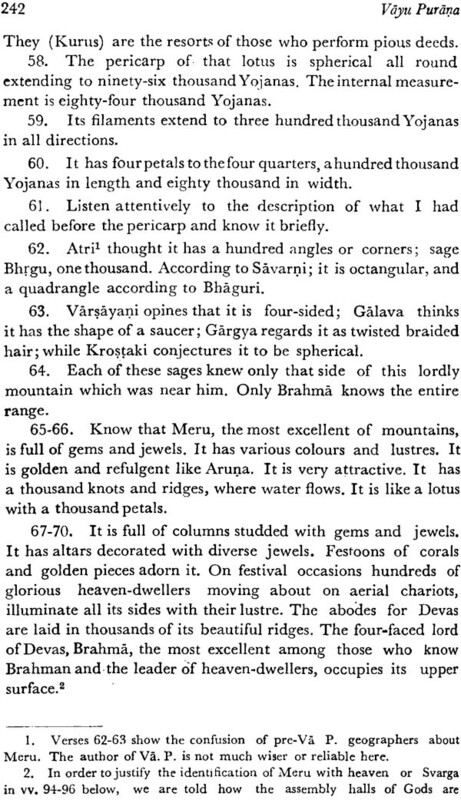 In the present part cosmogony is discussed in great detail and a good deal of geographical material is found. 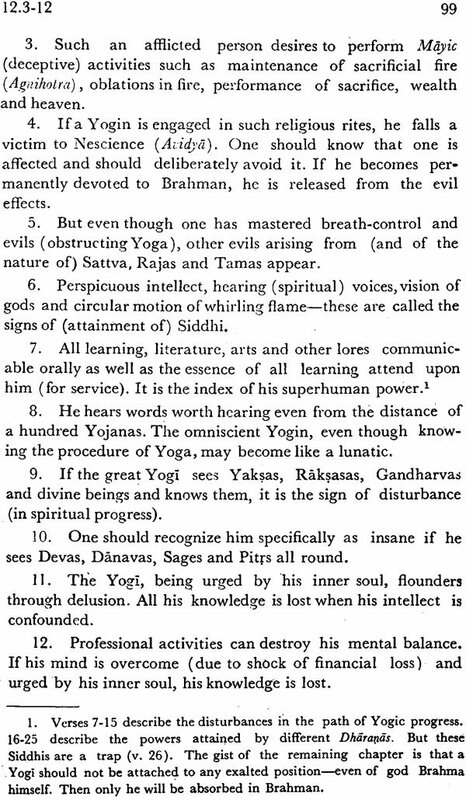 The translation is preceded by a long scholarly Introduction highlighting the salient features of the Purãna. 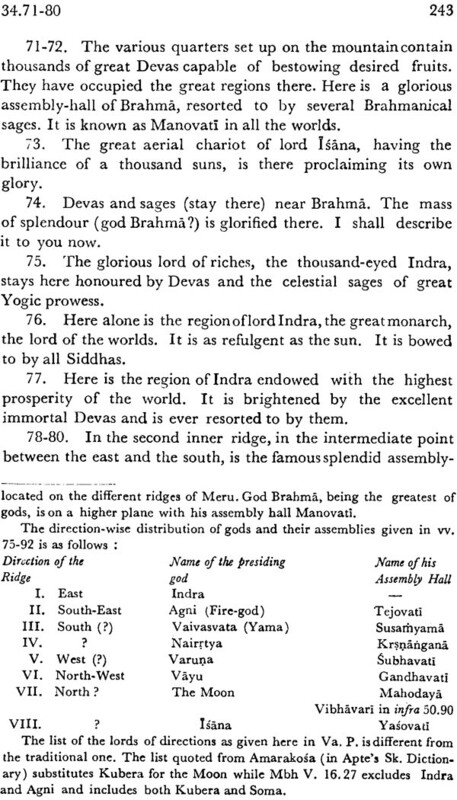 It is our pleasant duty to put on record our sincere thanks to Dr. R. N. Dandekar and the UNESCO authorities for their kind encouragement and valuable help which render this work more useful than it would otherwise have been. We are extremely grateful to Dr. G. V. Tagare for translating the text and contributing the Introduction. 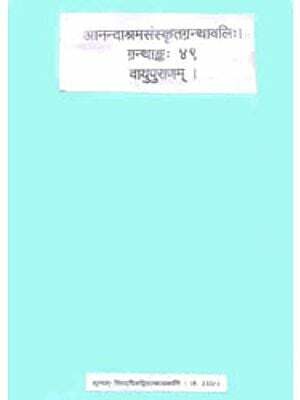 We are also thankful to all those who have been helpful in our project. 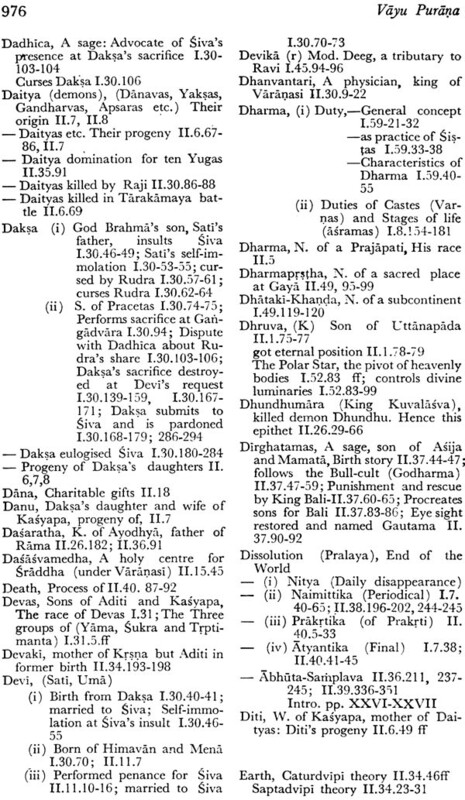 This close cousin of the Bd. 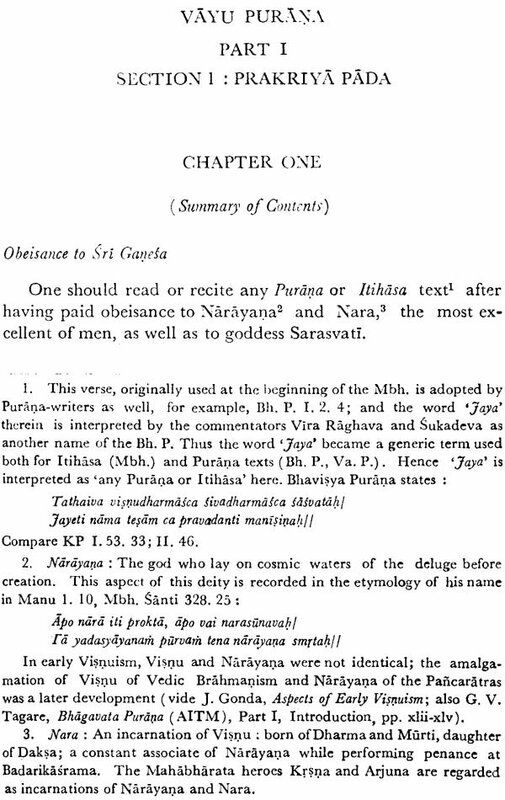 P (brahmanda Purana) is one of the oldest and authoritative Puranas, Nibandhakaras (writers on Dharma Sastra) like Apararka Ballalasena, Devana Bhatta Profusly quote it one Sraddha Dana, Tirtha, Asrama etc, Designating their sorce as Vayaviaya. They use this term to imply this Purana and not the Vayviya Samhita in Siva Purana. 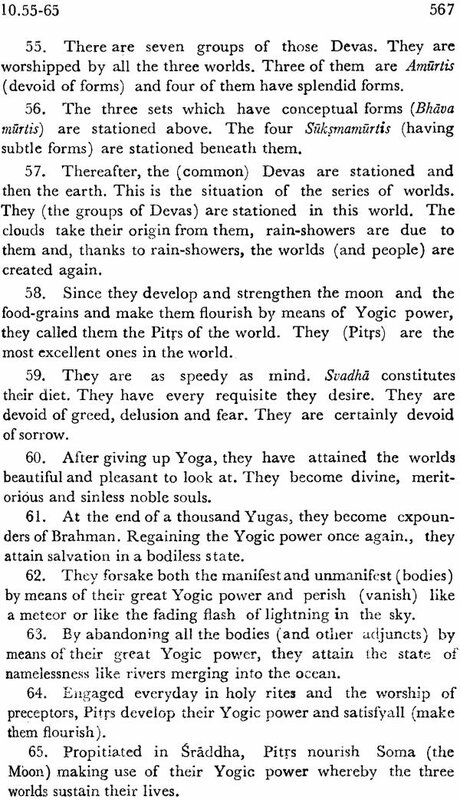 It is called Vayu or Vayaviya as Vayu narrated it to elucidate Dharmas and the glory of Rudra and it pertains to Sveta Kalpa. 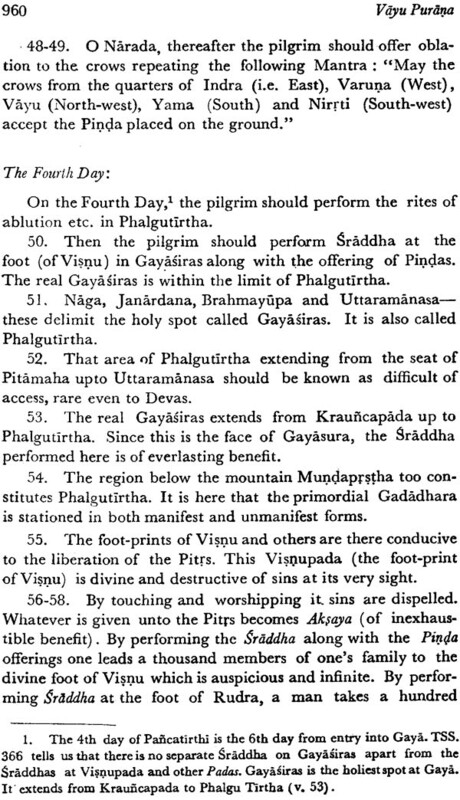 The Va. P (Vayu Purana) states that it consists of 12000 verses and is divided into four padas. 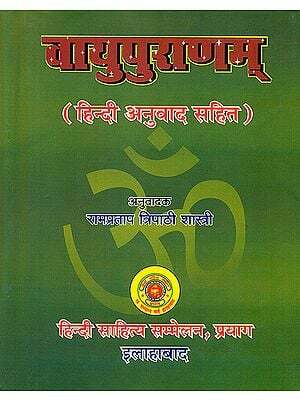 In this break up the problem of spilling over three chapters of Upodghata Pada (Chs. 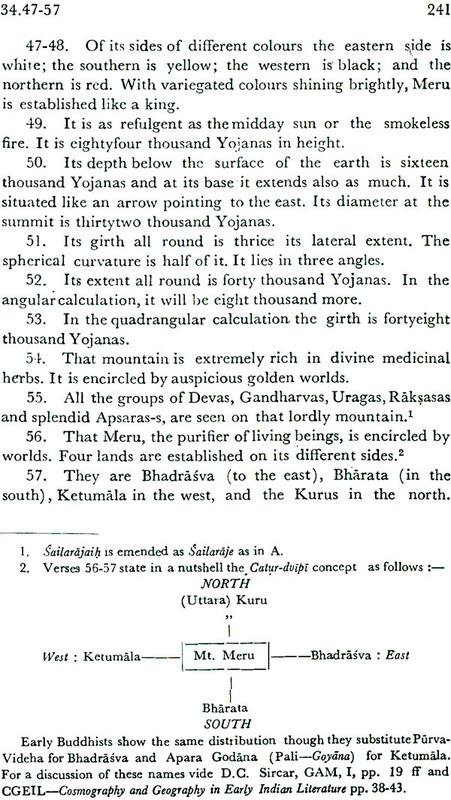 62,63,64 in A) into Uttaradha (as Chs. 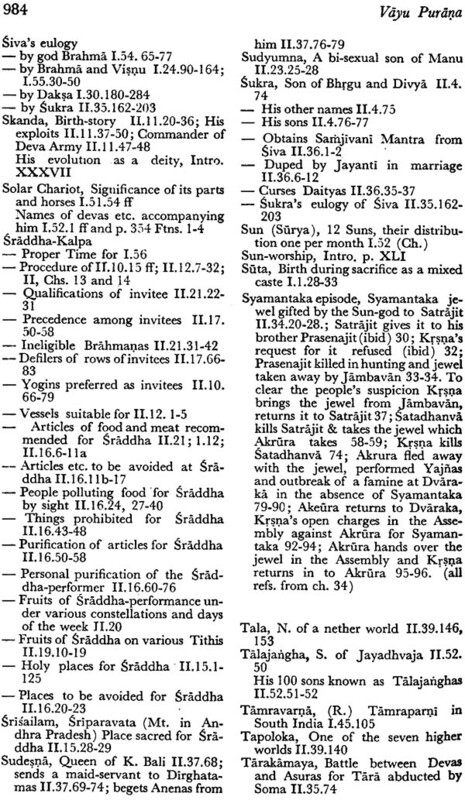 1-3) does not arise. 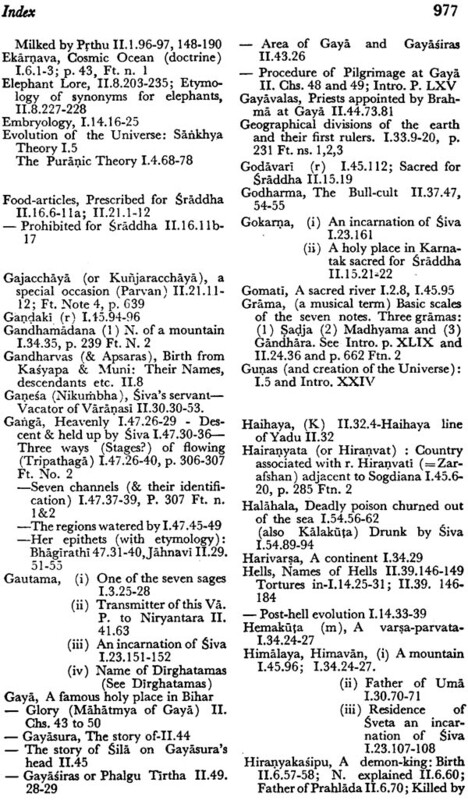 Even our text states that the original Samhita was divided into four Padas (1.61.5). 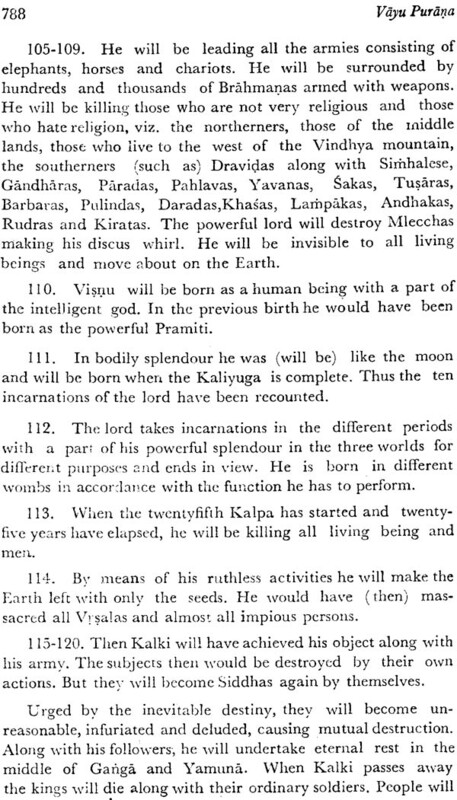 Later on it specifically confirms it and states that Vayu god is its narrator. 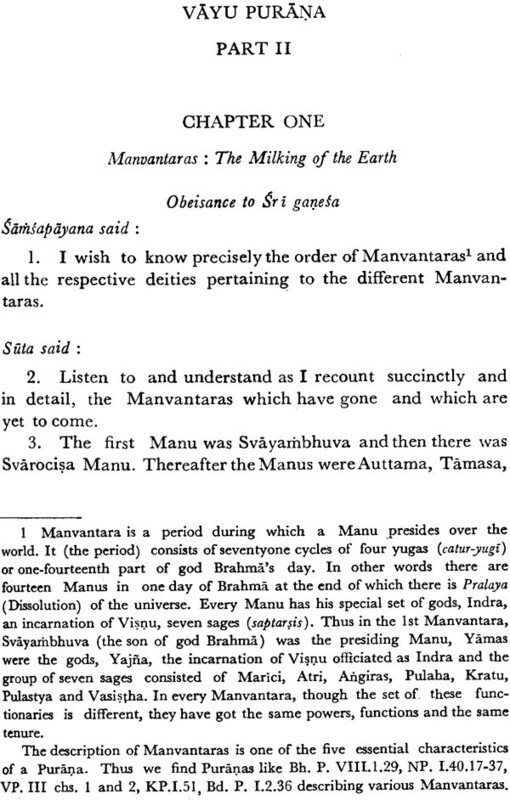 The wind god himself has narrated this popular Purana consisting of four Padas viz Prakriya the first section where the story is taken up (the other or sections being) Anusanga Upodhata and Upasamhara. 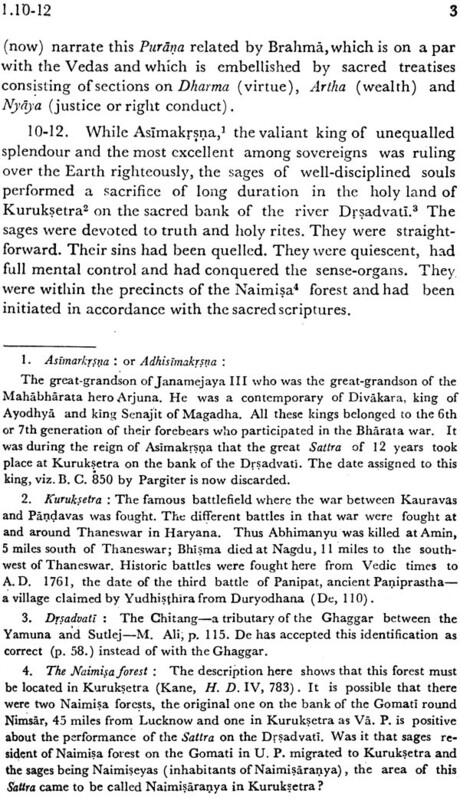 The division of the purana into purvardha and Uttarardha is of a later date. 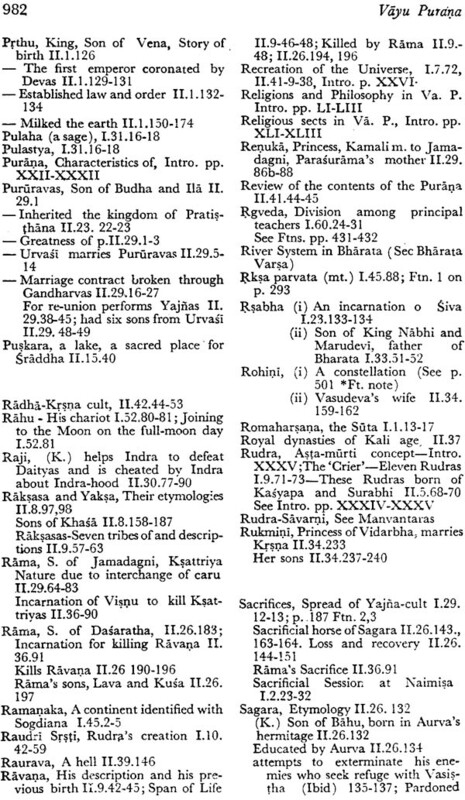 The original Va. P ended with Ch. 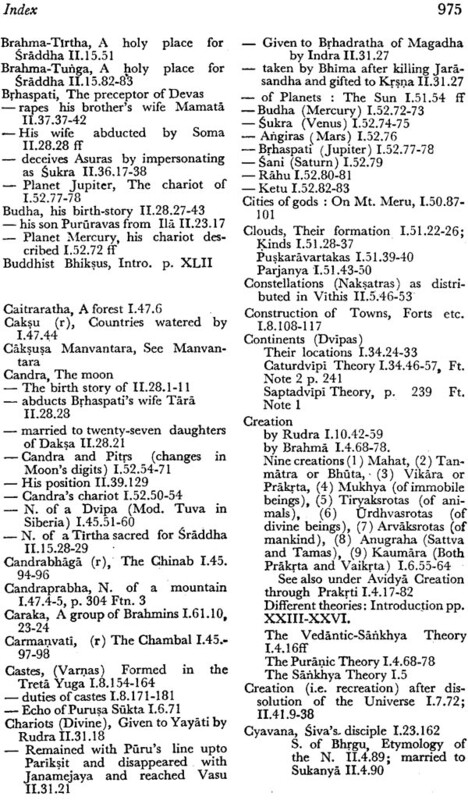 41 of Uttarardha (ch. 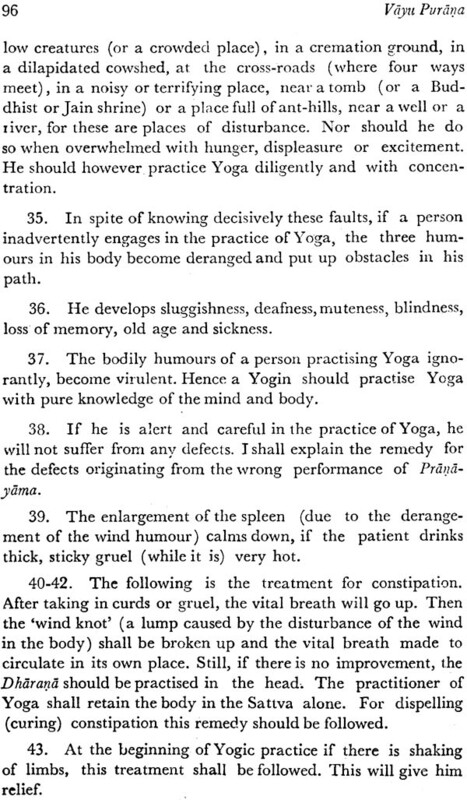 103 in A). 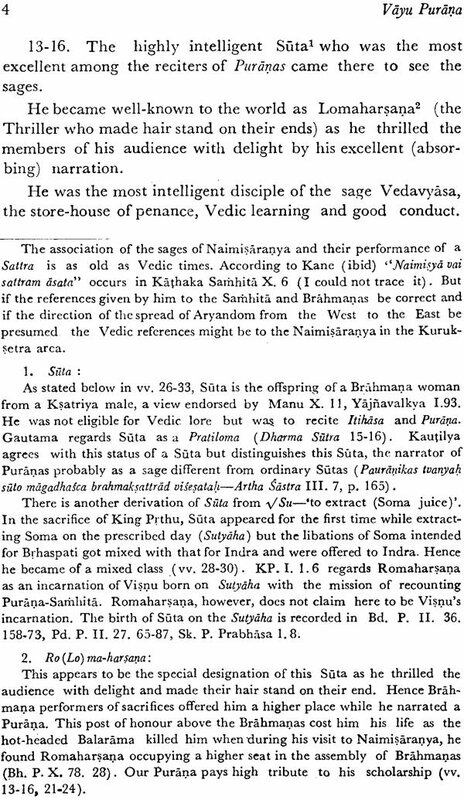 The sages who listened to Suta’s narration of the Va. P expressed their satisfaction at the narration of the Va.P. They gratefully honored the suta. 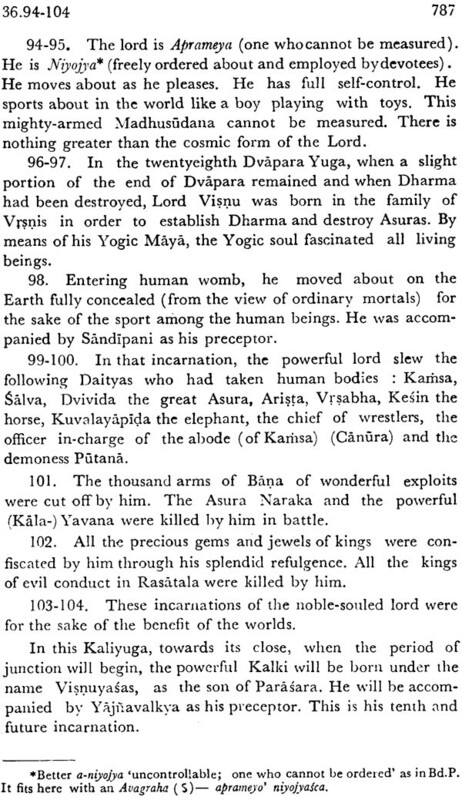 The end of the narration of the purana and the conclusion of the sacrificial session at Namisaranya synchronized. The sacrificers had their valedictory bath and they went to heaven. 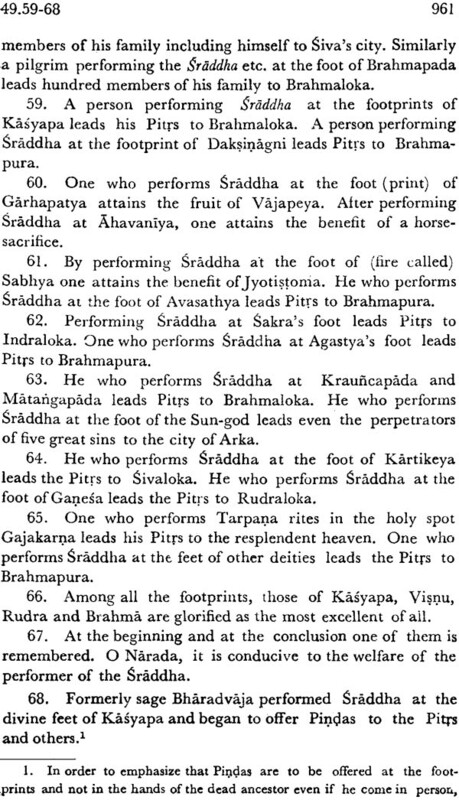 The last redactor of this Purana exhorts his listeners to worship deities perform sacrifices and go to heaven at the end of the life. 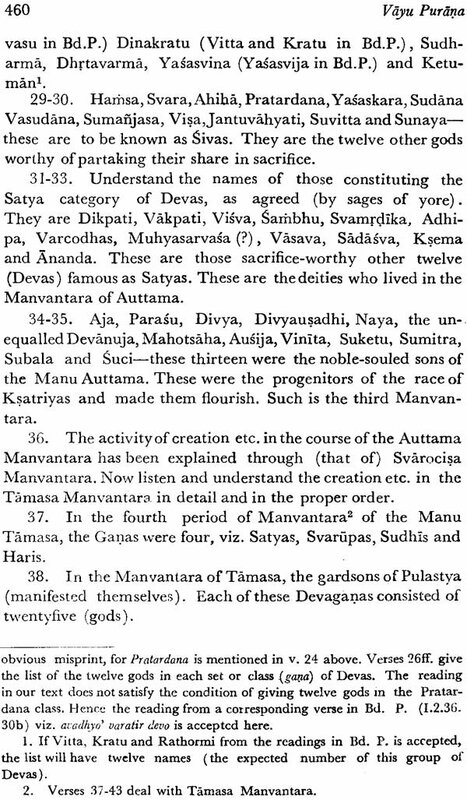 The same chapter traces the genealogy of teachers who transmitted the text of the Va.P from god Brahma to Suta and Samsapayana (II.41.58-66). 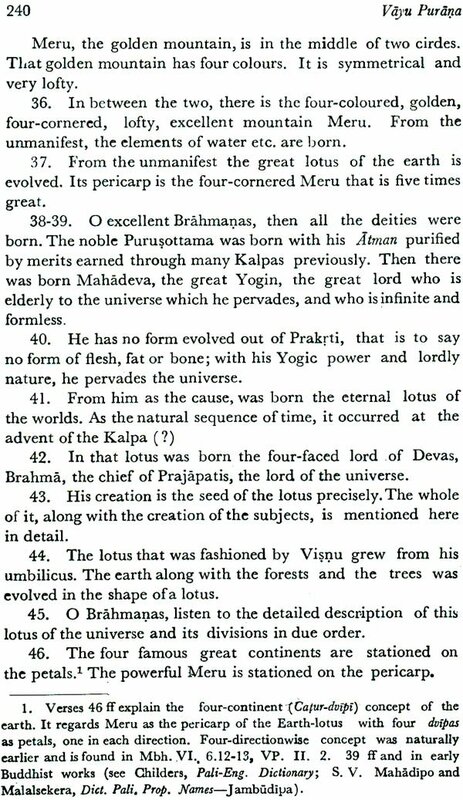 After stating the fruit of listening to this Purana and laying down prohibition of the transmission of the Purana of undeserving persons the author concludes the Purana with salutations to the lord Mahesvara. 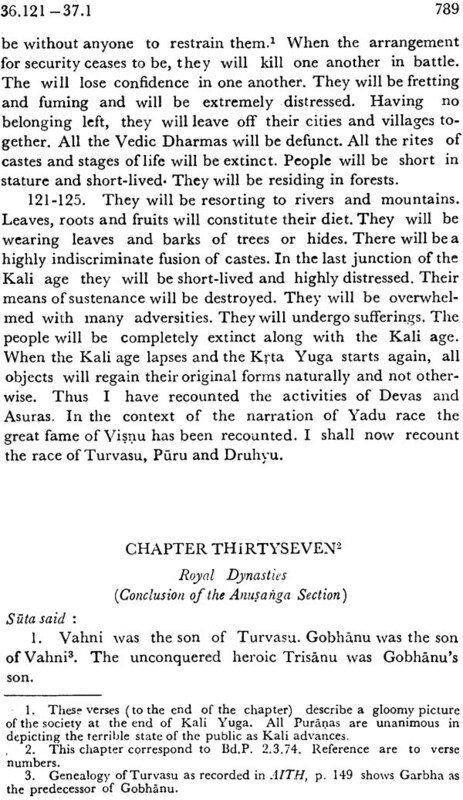 As shown in the notes to II.42 that chapter is a later accretion it comes after Phala-Sruti accepts Adhyasavada (vv.30-31) of Sankara quotes from the spandakarika of Vasugupta and advocates Kashmiri Trika Saivism brings in Radha Krsna cult (vv.44-45) and Vyasas dejection after completing (so called) eighteen Puranas which is an echo of Bh.P I.4.26-31 and subsequent chapters one wonders why the agni P. Visnu P and Linga P. which are uniformly found in the standard lists of Puranas are deleted here and one Adi Purana is added to the list. 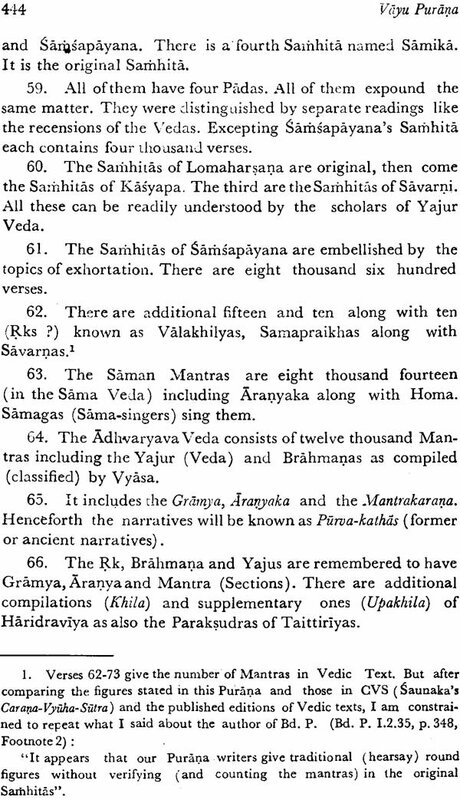 About the number of verses no criticism in necessary as these Purana writers depend on hearsay or traditional information in this matter and did not count the verses. 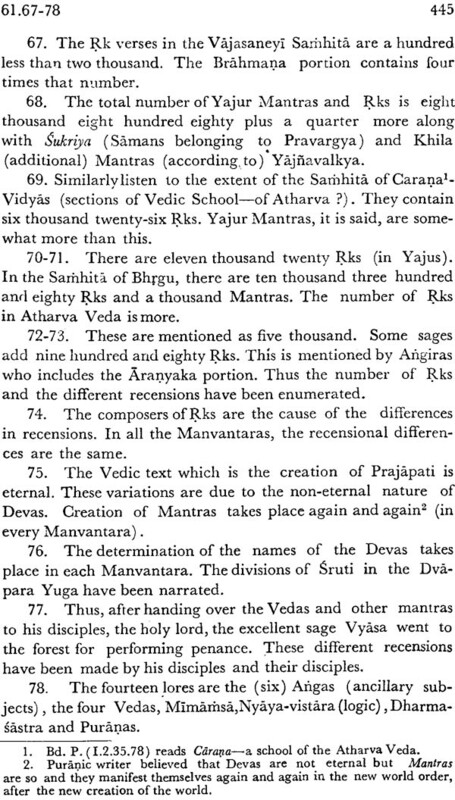 It may how ever be argued that these numbers of verses actually existed then in the MSS of Puranas available to those Purana redactors. Gaya Mahatmay (II, Chs. 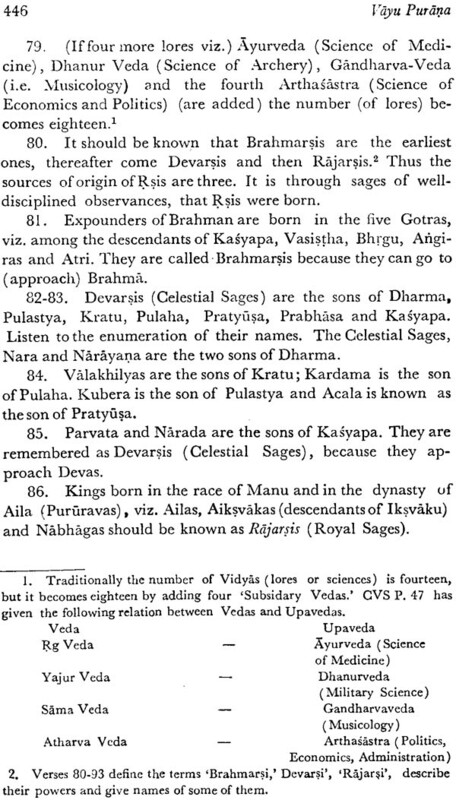 43-50) is obviously an interpolation. 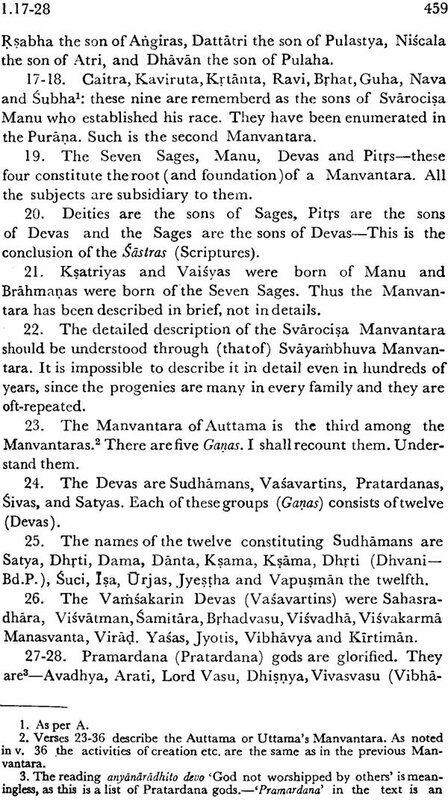 The motive of this interpolation may be synthesizing Saivism and Vaisnavism. 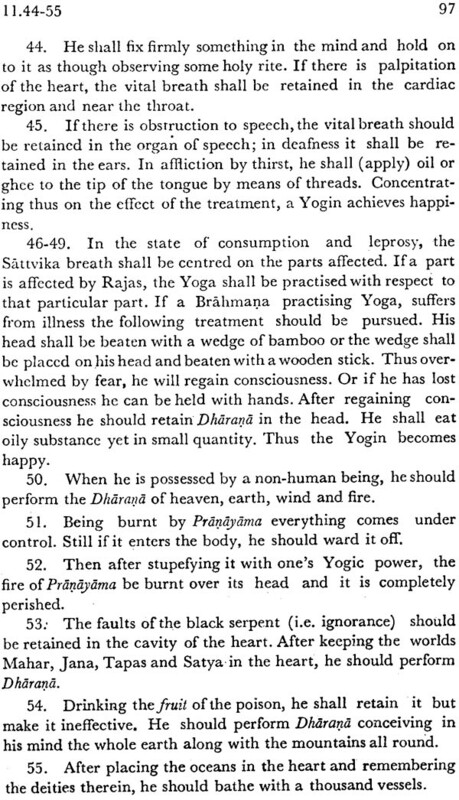 The Va.P mainly advocates Saivism and to counter balance it. 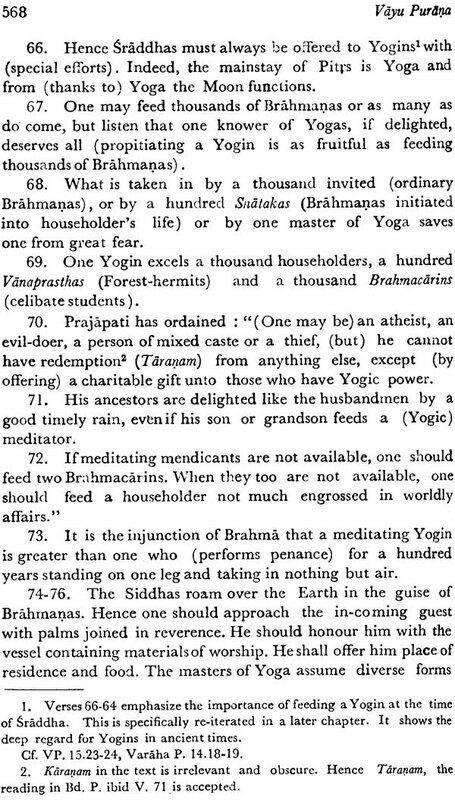 Gaya Mahatmya which emphasizes Vaisnaism appears to have been added here. 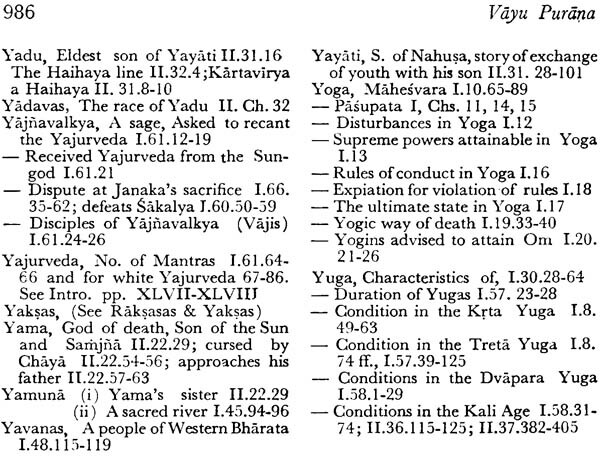 This mahatmya has a nominal tenuous connection with the Vayu P. only the first verse of the Mahatmya is attributed to Vayu. 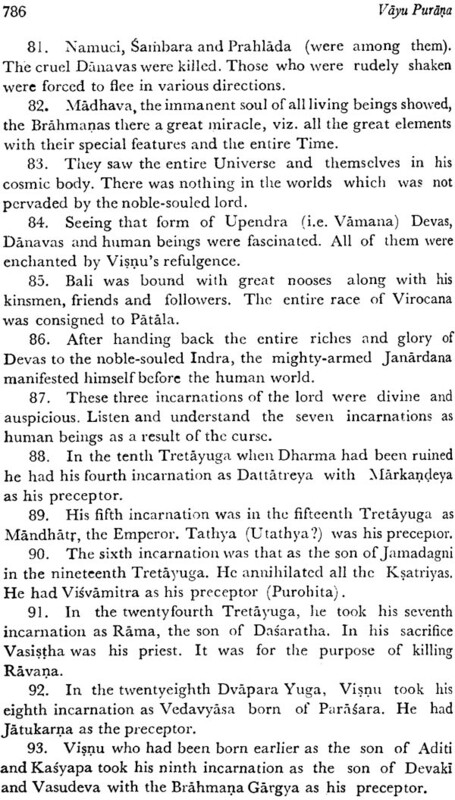 The real interlovutors are Narada and sanatkumara. 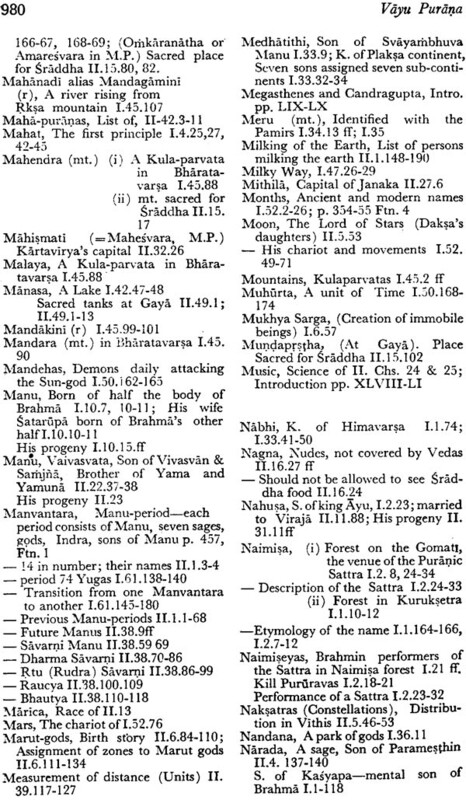 Moreover a considerable number of verses are common to this Gaya Mahatmya and those in the Mbh, Vana Chs 84-95 Np. 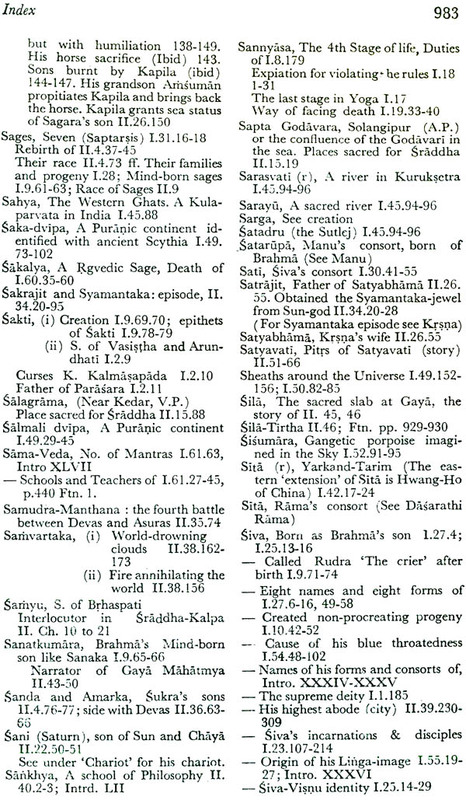 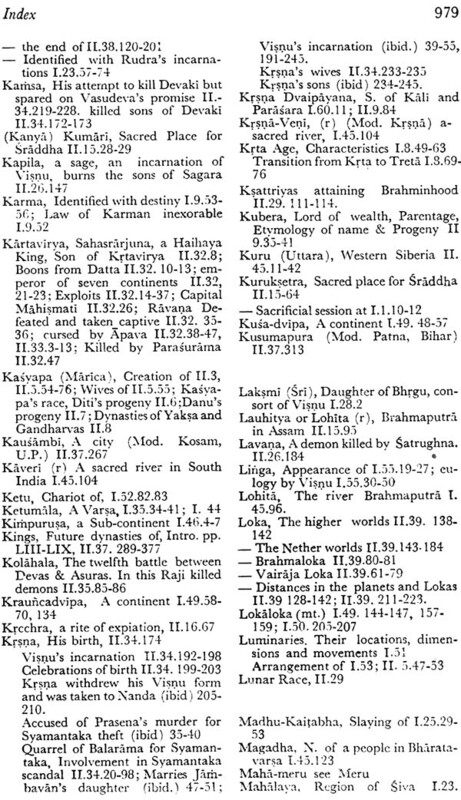 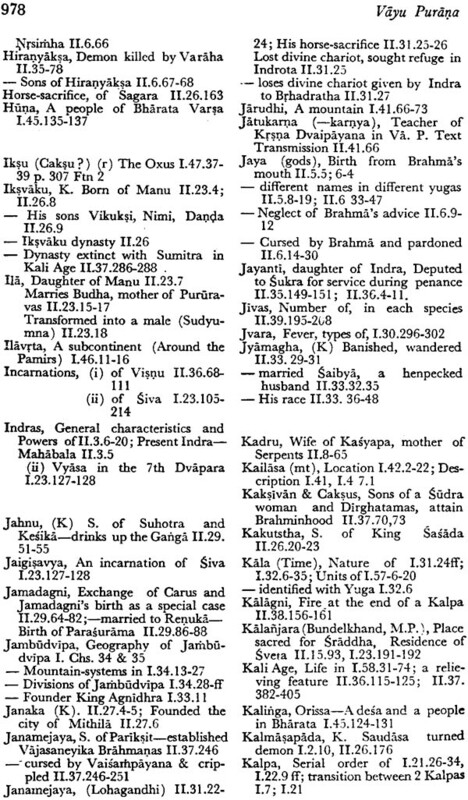 Uttarabhaga Cha 44-47 Gp Chs 82-86 AP, 114-116 Kp II 35 it shows that there must have been an independent work called the Gaya Mahatmya form which these Purans borrowed these verse.